Perfect for meetings, conventions and other large gatherings, these vinyl holders with transparent color bar offer the convenience of card carrying and display with the added bonus of role recognition. 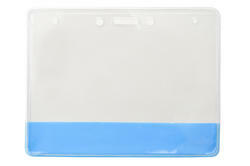 This flexible horizontal holder is made of clear PVC vinyl with a transparent color bar across the bottom. The color bar is transparent enough that text printed on the bottom of the insert can still be read. Product Dimensions	4.35" x 3.38"
Insert Dimensions	4.00" x 3.00"